Whether you are working on a craft project or need to repair something around the home, you've run into a situation where you need to glue leather to plastic. Since these are two very different surfaces and textures, you want to use a contact adhesive, which is a type of glue that adheres to itself along with all surfaces it is touching. To find a suitable glue, you must find a versatile, heavy-duty glue that works well for both glue and leather without causing damage to either surface. Glue leather to plastic with contact adhesive. Wipe both surfaces with a damp cloth to remove dust. Allow both surfaces to air dry. 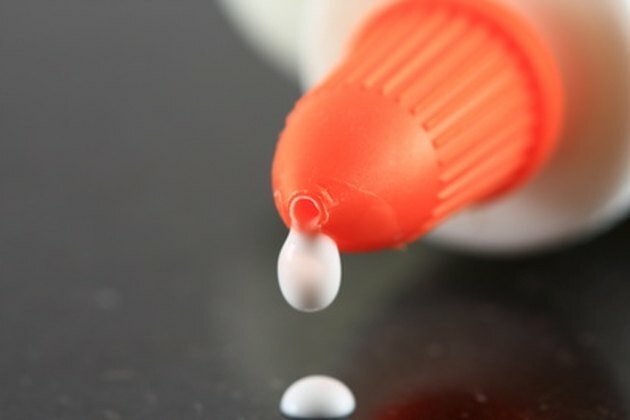 Apply a small dollop of the contact adhesive to both surfaces, and rub with your fingertip to spread a thin, even layer over both the plastic and the leather. Wipe your finger off on the damp cloth. Position the leather and plastic in place, and firmly press together the two surfaces. Place a heavy object over the two--when possible--to hold the strong adhesion. Let the two surfaces sit in place until dry, which typically takes up to 4 hours depending on the surfaces sizes that you glued together.